Trinidadian Kids Taken Away To ISIS Reunite With Mom, With Help From Pink Floyd's Roger Waters After four years in Syria, two brothers returned home to Trinidad this week, following an extraordinary intervention by their mother, a renowned human rights lawyer, and Roger Waters of Pink Floyd. Mahmud, 11, Ayyub, 7, and their mother, Felicia Perkins-Ferreira, walk toward the boat that will take them out of Syria, across the river to Iraq, so they can start their journey home to Trinidad. Felicia Perkins-Ferreira cried while recounting how her two young sons were taken by their father from home in Trinidad to live under the Islamic State in the Middle East. She had a blanket stitched out of their school uniforms and other clothes for comfort. She became plagued by panic attacks and exhaustion. "Every time I fell asleep, I'd dream that my children were there beside me," she said. But they were gone. It was too much to bear. "So I just preferred not to sleep." Now that agony is over. After four years of surviving life under ISIS, through war and in a detention camp in northeastern Syria, Mahmud and Ayyub — ages 11 and 7 — finally returned home to Trinidad this week, following an extraordinary intervention by their mother along with a renowned human rights lawyer and an international rock star. Roger Waters, a founding member of the band Pink Floyd, brought his celebrity power to help overcome many of the obstacles involved in securing the release of an ISIS fighter's children and flying them back to their Caribbean homeland. "A mother and a couple of kids separated. It's simple; you have to put them back together," Waters told NPR, which, alongside The Guardian newspaper, was given exclusive access to the rescue mission. 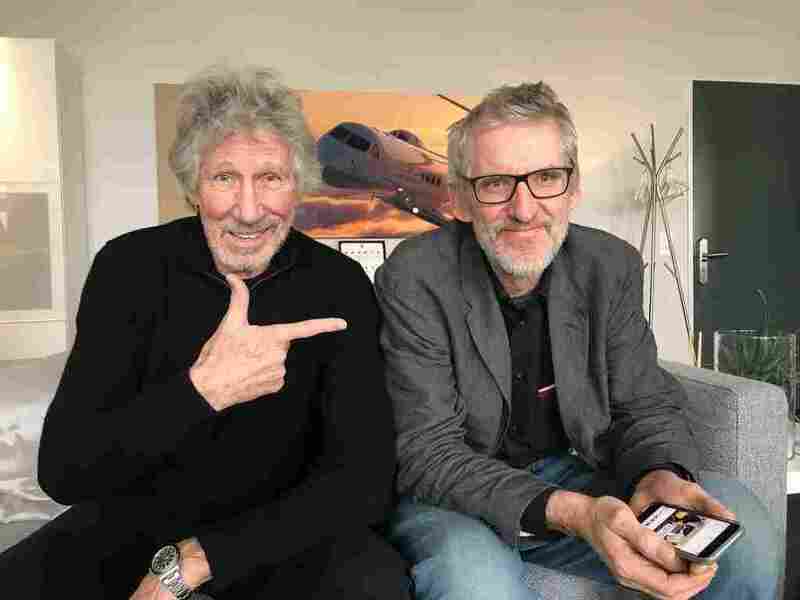 Roger Waters (left), a founding member of Pink Floyd, sits with Clive Stafford Smith, his longtime friend who heads the nonprofit human rights group Reprieve. The organization is known for its efforts to help people wrongly detained and to close the Guantánamo Bay prison. Waters said he decided to help these children after hearing about their situation from Clive Stafford Smith, a longtime friend who heads the nonprofit human rights group Reprieve. The organization is known for its efforts to help people wrongly detained and to close the Guantánamo Bay prison. 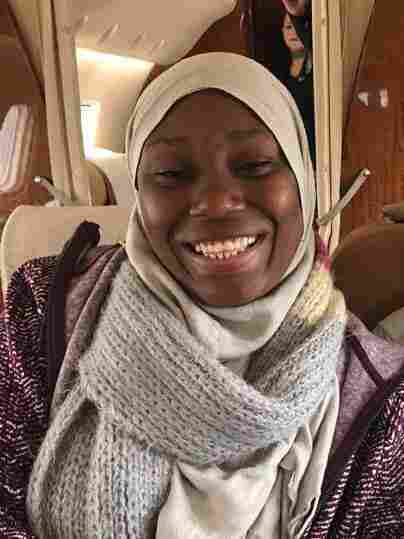 The rock star chartered a private jet in Switzerland, which flew Perkins-Ferreira on the final leg of her long journey from the Caribbean to Iraq. And then Stafford Smith and Waters hatched a plan to get the children out of neighboring Syria. "I still won't believe this, I still won't be able to relax until my children are with me, home," Perkins-Ferreira said, looking out the jet window at snowcapped mountains below. The trip out of Trinidad was her first time flying. The boys' Trinidadian father took them to Syria in 2014, when the younger son Ayyub had just turned 3. Perkins-Ferreira said she and the father were still married but separated. He came to her house, in a suburb of Trinidad's capital Port of Spain, supposedly to take the children for a day out. Felicia Perkins-Ferreira had never flown on a plane before her journey from Trinidad to reunite with her boys in Iraq. "He told Mahmud and Ayyub to tell me they loved me," she recalled. Then, the boys and their dad disappeared. Her estranged husband would not answer calls or messages. She says she didn't hear from him for several months, until she got a call from Syria. For four years, the only contacts Ferreira-Perkins had with her sons were sporadic phone conversations and grainy video calls. "If I tried to ask where they were in Syria or tell him to bring my children back, he'd cut the line and I wouldn't get to speak to my children for weeks," she said. The boys lived in the Syrian city of Raqqa, which served as the capital of ISIS territory, until U.S.-led coalition forces launched a heavy assault on the city and took control in October 2017. Their father then gave the children to a Belgian woman whom he had married in Syria, asking that she take them with her as she tried to flee toward Turkey. What happened next is unclear, but in 2017, Kurdish militiamen eventually found the boys abandoned on a road and took them to a camp that holds foreign women and children of ISIS. The Roj camp is one of three shelters in northeastern Syria that hold more than 550 foreign women and over 1,200 foreign children, who face an uncertain future, with many of their governments unwilling to take them back. An American detainee at the Roj camp, Samantha Marie Elhassani, also known as Samantha Sally, looked after the boys. Last summer, after the Syrian Democratic Forces transferred Elhassani to U.S. custody, she was charged with terrorism crimes. The boys were so traumatized and so young after being taken from Trinidad that they didn't remember their mother's name. But in a meeting with Stafford Smith, Elhassani passed him a photograph of Perkins-Ferreira that she had found among their possessions. Stafford Smith enlisted the help of a Guardian journalist, who eventually tracked down Perkins-Ferreira in Trinidad. After securing the children's emergency passports from the government of Trinidad and Tobago, Stafford Smith needed to persuade the authorities of the semi-autonomous Kurdistan government in northern Iraq to let the boys cross the border. Kurdistan officials said privately that they feared angering allies in the U.S.-led coalition against ISIS, which have so far largely refused to engage with their citizens held in Syrian camps and have in some cases responded by stripping their nationals of citizenship. There were also concerns that allowing the two young children to cross the border from Syria could set a precedent of northern Iraq becoming a route out of Syria for the hundreds of detained ISIS families. "I chose to help these children because when I met them in the camp, they were weeping and said what they wanted for Christmas was to hug Mummy," said Stafford Smith. He is campaigning for the governments of other foreign detainees in Syria to allow their citizens to return. "If governments want to prosecute their national[s] when they go home, then be my guest, do that, absolutely. But what you can't do is forget history and say that we can just find everyone guilty and leave them in the camp," he said. "That's the mistake ... with Guantánamo." He said U.S. detentions without trial have led to more extremism. 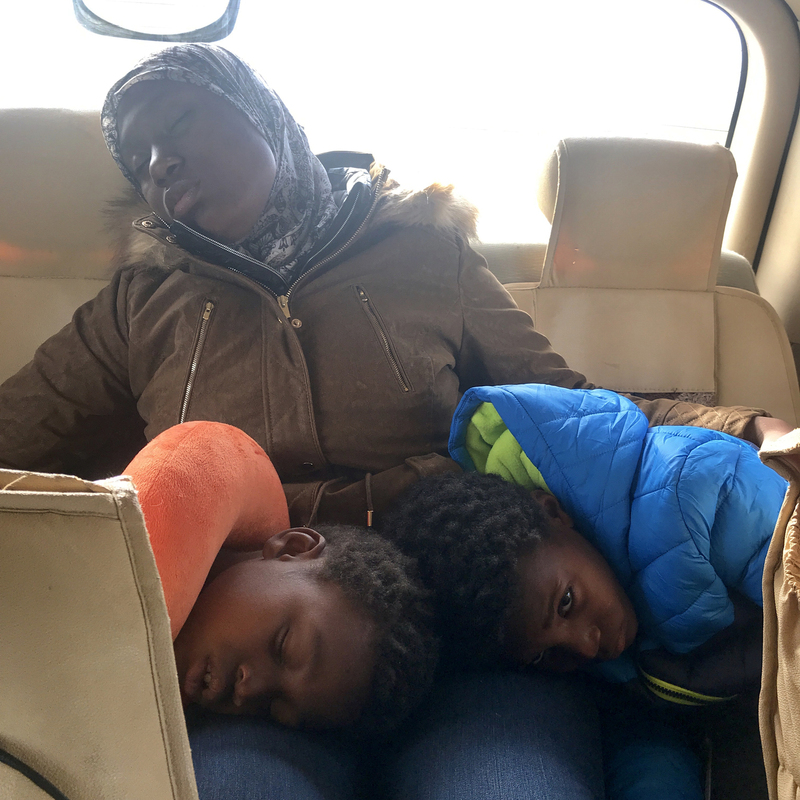 Felicia Perkins-Ferreira dozes with Mahmud, 11, and Ayyub, 7, on their journey out of Syria. This week marked the first time they have been together in four years. Touching down in Iraq, Stafford Smith used Waters' fame to secure high-level meetings with officials from the Kurdish regional government to talk about Mahmud and Ayyub's plight. Waters praised the "humanity" of the region's officials to Falah Mustafa Bakir, the head of the foreign relations department, as the two men conversed, sitting in ornate, gold-painted chairs beside large Kurdish and Iraqi flags. The glad-handing mission then included a tour of the old citadel in the Kurdish city of Irbil. With the requisite permissions approved, Stafford Smith and Perkins-Ferreira made the journey into Syria on Monday. They traveled to Qamishli, where they would meet the boys in an administrative building for the Syrian Democratic Council, the Kurdish authorities there. Perkins-Ferreira was hoping for a quiet reunion, to hug her children in private after the long separation, but the Kurdish authorities in Syria wanted to promote their decision to release the children to their mother. The reunion turned into a media frenzy. Seeing Mahmud and Ayyub for the first time in four years, Perkins-Ferreira and the boys cried and she hugged them close to her. She seemed intimidated as dozens of journalists crowded the family with cameras and microphones. Wearing new coats that Perkins-Ferreira had brought for them, the family traveled back to the Iraqi border. On the car ride, they slept deeply, Mahmud and Ayyub nestling their heads on their mom's lap. But the challenges were not over yet. 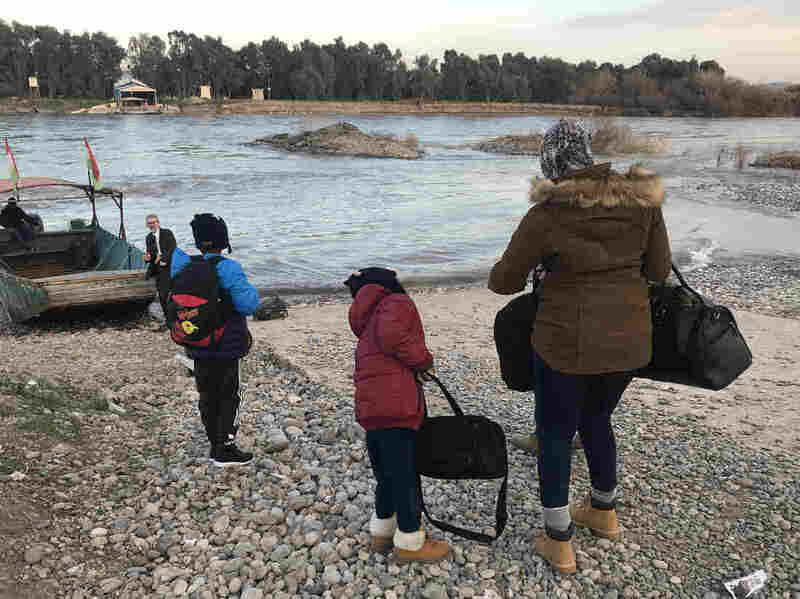 After the group crossed the Tigris River between the countries, Iraqi border officials held the family for two hours and then escorted them to a security office in the northern Iraqi town of Dohuk. There, under the bright fluorescent strip lights of the police office, they waited for several more hours, as security officials asked them questions and waited for the final clearance from Irbil that they could pass through Iraq. "Do you know what your father did in ISIS?" a police officer asked 7-year-old Ayyub. "Do you speak Arabic now?" he asked 11-year-old Mahmud. The boys do speak Arabic. But afraid and exhausted, they ignored the questions, keeping their heads down and playing a game on their mother's phone. In the police station, as the hours ticked by, Mahmud began to sob, suffering from a pounding headache. Perkins-Ferreira held him close. Ayyub drew a picture of a house on a piece of paper. "This is my house in Trinidad," he told his mom. "It's where I want to go." Back in a hotel in Irbil, Waters grew anxious and frustrated. "What's going on? Why are they doing this? They're traveling with their mother! With birth certificates, with passports!" he fumed to Kurdish officials. The officials tried to appease him, making calls to resolve the delay. Late in the evening, the authorization finally came through. After kind apologies and dinner, we continued on to Irbil, arriving after 1 a.m. Waters greeted the boys in Irbil with large hugs. "Get these children to bed!" he said. The children and Perkins-Ferreira went to a suite in the hotel he had booked for them. Perkins-Ferreira said that before the trip, she had not heard any songs by Waters or Pink Floyd. "I am going to check [your music] out myself," she told him in a conversation during the rescue effort. "I'm going to be in the shower, shaking," she said, using a slang expression for dancing.